Mihai Nicodim Gallery is proud to present “Ideal Hauntology”, the first solo show in the US of British artist Hugo Wilson (b. 1982). His new body of work is an investigation into reactions and responses to things, contextually, emotionally and historically. Images and objects as manifestations of faith can hold one meaning in a certain context, but can be redundant in another. When or why is an object or image given an importance and elevated? If the person viewing is not of the relevant faith is the importance removed, or does the weight of its own history keep it there? Or are these things merely a seductive way to keep the fear of the chaotic unknown away, and to give us purpose and meaning, and a physical representation of what we don't or can't know? The installation "Nostalgic Reception" takes the image of an unclassified cloud formation. The image is then placed on two redundant media, an old satellite dish and an antique globe, both things used for the giving and transmitting of information. On the globe the image is a hyper-real photograph and on the dish it’s a romantic oil-painted version of the original image. Wilson is interested in the space between transmission and reception and what happens there in order to make a piece of information pleasing or relevant to an individual. Classification and, more importantly, the need to classify play a large role in Wilson’s new body of work. It serves as the foundation for the making of the "32 drawings". The 32 objects in the drawings are all manifestations of faiths and superstitions. By removing all context and having one size and one medium, the object is laid bare for what it is, some are recognizable and other less so. The presentation draws the viewer in to try and create a system of meaning or importance within the grid of objects, when they have no real link, other than the fact that they have all been elevated from their physical status by human decision. The context of this classification, and the reaction it brings is profoundly enthralling to Wilson. The two paintings of the cows are rooted in the tradition of 18th century, celebratory agricultural painting. The prize bull creates a nostalgia for rolling fields and a "good old England". Both these animals are very contemporary versions of the original line-bred animals in these old paintings. The Belgian Blue has been highly line-bred using the knowledge of a hormonal abnormality, to create a monster animal with double the amount of muscles. The Holy cow is half Indian (sacred) cow, half Texan beef known as Brahman cattle, utilizing the sacred cows sweat glands which help survival of herd in dangerously hot Texan summers. Seeing the newer versions of these animals flaws the origin of Wilson’s nostalgic reaction to the 18th century pictures. His feeling of the world being right in the 18th century is overshadowed by these works being actually a record of dominance over the order of nature, the contemporary versions being grotesque and potentially sacrilegious (in the case of the Brahman cattle). They also highlight Wilson’s difficulty of holding one ideology. Is it better that the herd survives and the American farmer yields higher profits than debasing the sacred belief of the holy cow? The gravity that an oil painting can convey is also one of Wilson’s interests. In the case of the "Merchant”, the artist is looking at the 17th century "swagger portraits" and the message that they were intended to and do convey. Wilson plays humorously with the idea that the monkey has the same air of self-importance when he clearly couldn't have commissioned the work himself. Wilson is also fascinated by the animalistic reaction placed against a more informed conscious reaction. In the "Head Studies", animals already provide a strange arena for reaction. Placing the sacred lamb in the same context as the drooling hyena and the closely human proboscis monkey plays on these reactions. The final piece "Zurbaran" serves as historical revisionism for 17th century Spanish catholic works, which were created to inspire devotion and mystery. By tinting the image with Holy water (and water-color) Wilson hopes that this importance is re-examined. 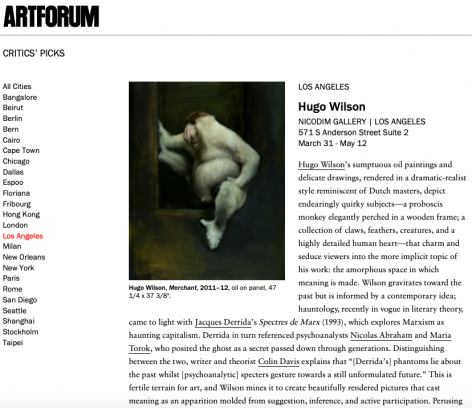 Wilson imbues his work with optimism and hope. His search for middle ground between science and nature provokes fresh thought among his viewers that raises a set of universal questions regarding the bounds of humanity and the merits of modern progress.